We said goodbye to our foster sons a little over a week ago. Everyone asks how we deal with the sadness of saying goodbyes to these little people we love so much. Honestly, the best way I can get through is just to keep busy. I also like to plan a little family outing or trip to help keep the girls minds off the goodbye as well. I was excited to check out the Americana Water Park in Niagara Falls. We have been to Fallsview Water Park and Great Wolf Lodge, and wanted to see how the Americana was in comparison. We checked in at 1pm and were able to use the water park until close the next day. We got to Niagara Falls early so first we spent some time site seeing, and touring around The Falls. When we walked in we were greeted by the friendliest font desk staff. She explained to the girls about the awesome theme room they were going to be sleeping in. The girls were anxious to check it out. After getting our keys, free wifi password, and a coupon book, we drove around back and parked our car. They have doors all around the hotel, so you can easily access the one closest to your room, this was super handy for me as I was the only adult bringing everything in from the car. The girls flipped out when the saw our suite. Log style double bunk beds, TV, bathroom, mini fridge, microwave and sink. The walls were decorated with mermaids, pirates, and even a cool monkey picture on the roof! Happily, mommy was on the other side of their door in a queen size bed. The main part of the room had another bathroom, a sitting area, desk, a larger mini fridge and lots of space. The room was very clean and we were literally the closest room to the water park. This made it very handy when we came back to rinse off and change for the evening. Although with being that close, it was a little loud outside our door at times with kids running down the hall, but it quieted down at a decent time, and the bathrooms had fans which blocked out any sound with the white noise. (A must for this mama, as I always sleep with a fan) We were able to sleep in even. We ate at the Boston Pizza, that is a part of the hotel. Great food as always, and we had such great service. My little one tripped (over her own feet) as we were walking in to be seated, and we made quite the entrance with her screams. The manager came over right away and asked if she was ok and told her she would get her something special. Our waiter went out of his way to ask us if she was ok, and they comped both the girl’s favourite dessert (worms and dirt). Thanks to the wonderful staff for making her feel special after her tumble! 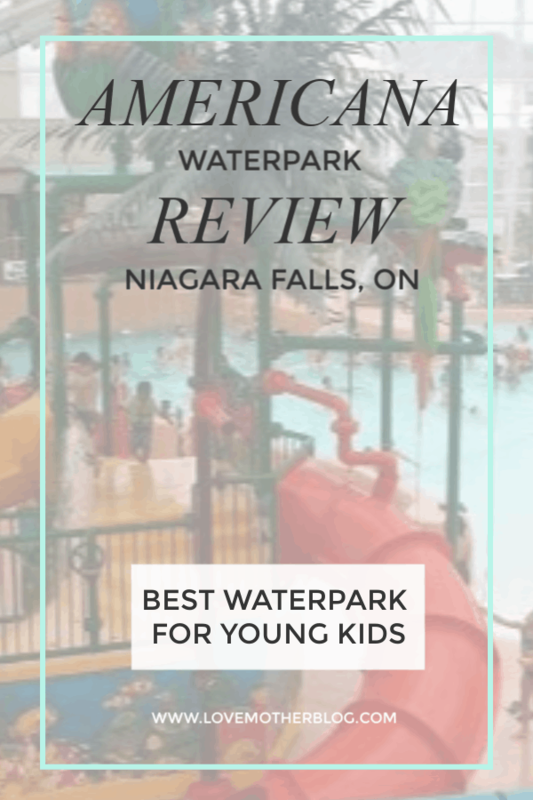 The water park is the perfect size for younger kids. It was easy to keep watch over them, and I didn’t have to worry about bigger kids knocking them over, which we have experienced in the past at other water parks. It was especially great for me, as I was single parenting it. There is a large wave pool in the middle, and my daughters loved that, off to the side was a narrow opening that led to another little pool that was a bit deeper. It had large floaters in the middle. In the back is the toddler area, with a warm shallow wading pool, 3 small yellow slides, and swings (up to 20 lbs only). This is where my 3 year old liked to stay. She is a bit more reserved around water, and she was happy to just play with all the floating toys and balls. They also have a surf shop, a snack bar(alcohol available) and a bathroom/changing area. The charging area was kept very clean, with a large fan running in it. We went through the week, and it was wonderful. It wasn’t overly busy, the kids didn’t have to wait for turns on the slides. I felt very safe leaving my stuff just at a table, as there were great sight views everywhere. It is a well designed little park! The roof is fully transparent, and the sun shines right on in. The roof even retracts and the sides have huge garage type doors that open. The first day we were there it was hot out, and it was so nice to feel the warm breeze flowing through. The second day was a bit cooler, so the doors were not open but the temperature in there was still nice and warm. On their website it says they keep it 84 degrees year round. All the pools were warm, they also had a hot tub, and plenty of seating. There are 2 private cabana areas for an extra cost. There were many lifeguards on duty, and the slide attendants were friendly enough. They have a good size little arcade for the kids after they are all water parked out! The tickets were cheap, and $10 each, got my little ones an entertaining evening activity. Daddy surprised us and joined us for the second day, we enjoyed the park until 1:30pm, then headed out to eat at the Rain Forest Cafe, and ride the Hornblower Boat to the falls. We are so blessed to live so close so Niagara Falls, and we can easily go and be tourists. Next trip we have to make it to the Hershey’s Chocolate Store! The Americana, is a great affordable option for your family getaway. We were happy with our visit, and will definitely be returning. Thank you to the Americana for upgrading our room to the pirate suite!